Most people who follow me know that I LOVED Divergent. The book was fast-paced, engaging, exciting, thrilling; the characters charismatic, enjoyable, fun, and unpredictable; everything I ever wanted. I wish I could say that it was as fun as the first book. But it wasn’t. In this book, Tris was not the goal-driven, bravery-filled protagonist I once knew. She was cold, secretive, and unlikeable. The old Tris would not have kept secrets the way she did in this book, especially from Tobias. I wish I could say it was as fast-paced as the first book. But it wasn’t. It was like a chocobo race in Final Fantasy XIII-2 where you’re riding along gently, then you get a BIG BURST of speed, and then you’re even slower than before for a long time. The buildups were far too drawn out, and there was too much side-plot tension to focus on the actual plot. I wish I could say it was as engaging and thrilling as the first one, but there was too much repetition. 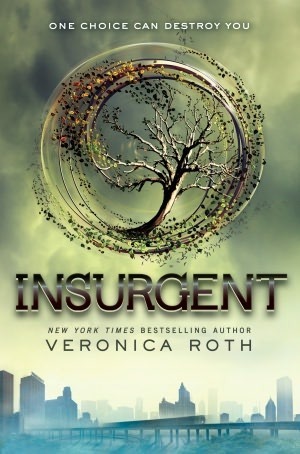 It was the same cycle over and over: Tris lies, Tris grows helpless, Tris has to have someone save her (the old Tris didn’t need saving), Tris confesses to her sin, Tris turns into a boring, sad, unlikeable protagonist, and usually makes some big unneeded sacrifice that involves a lot of pain for her. The thing that eats at our protagonist for the entire book is understandable. I seriously get why she feels the way she does, it’s only natural. But it turns her from what she used to be into a freaking vegetable, more or less. All she’s capable of doing in this book is disobeying/lying to people, especially the people she loves. Lately, all the books I’ve read lately have been written with an amazing voice. Such is the case with Insurgent. Tris’ voice calls from the pages with vibrancy, but the material she gives to you isn’t what you expected. That’s my biggest peeve with this story. Forget having Tris from Divergent. At the end of book 1 when she said she had to become more than Beatrice OR Tris, yeah...she failed. Miserably. Here’s the BIGGEST event that annoyed the living hell out of me in this book. After the Candor HQ is attacked by Erudite/Dauntless, Tris moves back to the Dauntless HQ with the Dauntless remaining. A simulation mixture forces some of the characters to jump off a building, after making the request the same thing will happen again and again if the Divergent do not hand themselves over to Erudite. So Tris, being the BIG SACRIFICIAL person she is, lies to everyone, pretends not to be afraid, and heads to Erudite to let them do what they will to her. I’m sorry, this was the most moronic thing in the book. I commend her for her bravery, but not her lies. I was SO TIRED of her lying at this point in the book. Also, the entire period of which she was being held in the Erudite HQ bored the hell out of me. It took me two weeks to pick the book back up at this point. Also, the big betrayal/plot twist didn’t surprise me. My bad. Anyway, my point is, the book was good. But Tris ruins it. She’s not the same person we knew and loved in Divergent. Of course I’m going to read the third book with the way this one ended, but this one just didn’t have the same excitement as the first. NOTE: REVIEWS, FROM NOW ON, WILL BE ON THURSDAYS. The next few reviews I post will be labelled, "Book Review Thursday." I saw this book at the book store the other day. I *almost* bought it. Now, I'm not for sure. Thanks for sharing your opinions!